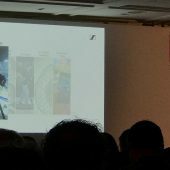 If you think about what experiencing things live entails, how it’s not just listening to the event occurring in front of you, but it’s also a combination of the sounds going on to your right, left, and behind that create the entire “natural sound field”, you can see how trying to record a VR video without an advanced sound recording method might fall flat. That’s where Sennheiser’s AMBEO comes in. 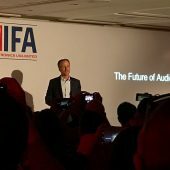 3D audio is the new frontier of excellence, set to transform the listening experience for users across a broad range of applications, from virtual reality gaming to audio recording and broadcasting. We have been active in this area for some time with 9.1 mixing and recording and the audio design for high-profile exhibitions. 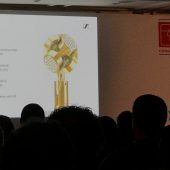 We are now increasing our efforts considerably to introduce this amazing sound quality into new products and applications, enabling users to experience and shape the future of audio. 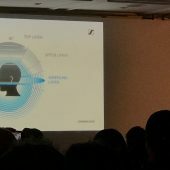 Last year, Sennheiser introduced their AMBEO microphone which created “spatial audio to match visual 3D experiences”; later this year, Sennheiser will start selling their AMBEO Smart Headset, which will allow all of us who are running around with 360º VR cameras to actually record the 360º sound that will complete the VR experience we are trying to replicate. 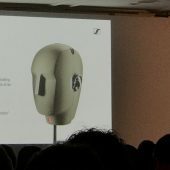 The Sennheiser AMBEO Smart Headset will be aimed at consumers, and it will not only let us create immersive 3D recordings, they will also allow us to listen to binaural audio recordings. 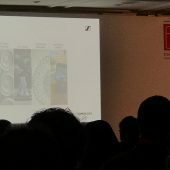 Binaural audio delivers an incredibly immersive 3D experience, placing the listener inside the soundscape and replicating the direction of sounds and spatial characteristics of a given environment. 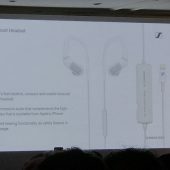 With the creation of the AMBEO SMART HEADSET, Sennheiser will bring this sophisticated recording technology to an intuitive pair of consumer earphones for the first time. 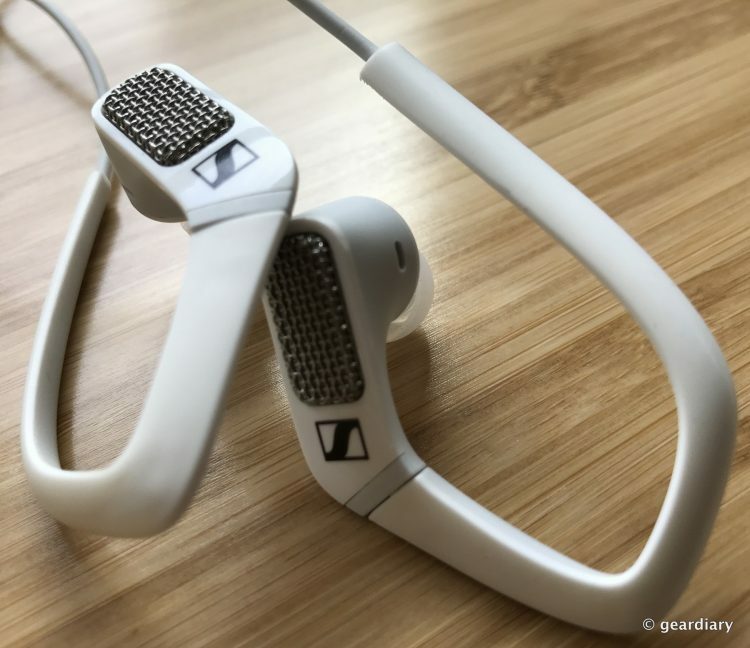 This easy-to-use product creates immersive, binaural audio that complements the high-quality video that is available from a wide range of consumer devices such as smartphones. AMBEO SMART HEADSET will be available in the second half of 2017. 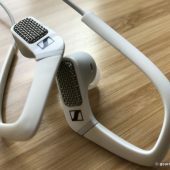 Sennheiser has once again partnered with the award-winning manufacturer of professional audio devices Apogee, an industry leader at the forefront of digital audio recording, for the creation of this breakthrough product. The AMBEO SMART HEADSET’s incredibly detailed and realistic recording is achieved via two omni-directional microphones integrated in the earpieces that work alongside a premium A/D converter, mic preamp and SoftLimit from Apogee. The two microphones capture the subtle differences in timing, volume and timbre that occur as sounds from different directions reach each ear. When played back on headphones, the result is a truly stunning lifelike audio experience in picture-perfect fidelity. It places the listener in the exact, original sound field, so whether you capture a rainforest or a buzzing city, listening to the binaural recording will make you feel like you are there. 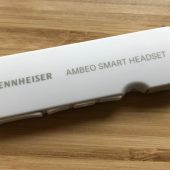 And yes, you can also use the Sennheiser AMBEO Smart Headset as an everyday headset because not only does it sound great, it has a built-in microphone for telephone calls and voice control. 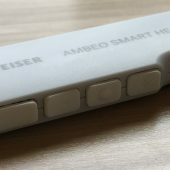 When it launches, the AMBEO Smart Headset will only be available for Apple iOS devices with a Lightning connector, but a USB Type-C version for Android devices is expected to be released later this year. 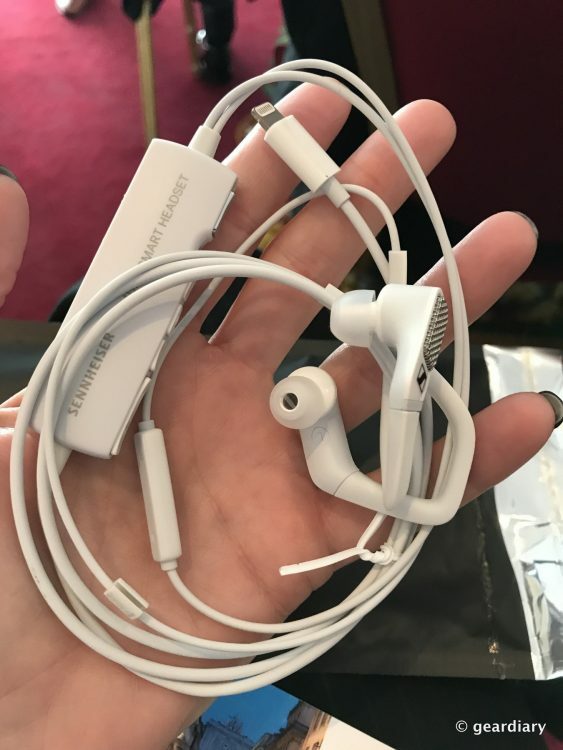 I don’t have a price or a release date (beyond some time in second-quarter 2017) for the Smart Headset yet, but I’ll update once I do.